Our Affiliate Program offers you the chance to share and promote our range of Bach Flower Remedies and Flower, Gem & Crystal Essences with your customers, readers, or network. As a Crystal Herbs affiliate you earn a commission on all purchases that are made by those who have followed your affiliate link. We pay a 'lifetime' commission of 15%. Commission is paid at the beginning of each calendar month ( please note that if there is less than £5 to pay we will roll payment over to next month). Payment by Paypal, Bank Transfer or Crystal Herbs Gift Voucher. Members receive an Affiliate Account email newsletter with special offers, Essence reviews and latest affiliate news. See both the number of affiliate hits and commission earned at any time by logging into your account. Our aim at Crystal Herbs has always been to make and supply the best possible quality Bach Flower Remedies and Flower, Gem & Crystal Essences and to help people reconnect with the essence of who they truly are through self-empowerment and spiritual growth. All of our Essences are handmade with love and care and we offer a wonderful range of different essences covering many aspects of personal and spiritual growth. We pay a 'lifetime' affiliate commission of 15%. This means that after a customers initial order, that customer is then associated with your affiliate account for all future orders, even if they don't follow your affiliate link to order in the future. 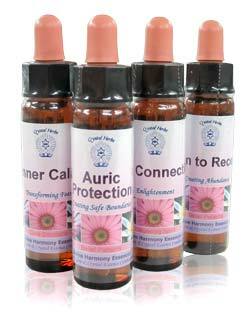 Payment for commission due is made by Paypal, Bank Transfer or Crystal Herbs Gift Voucher. 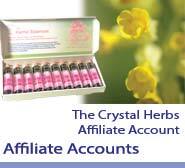 Who is the Crystal Herbs Affiliate program for? Our affiliate program is perfect for anyone with a passion for Bach Flower Remedies, Flower, Gem & Crystal Essences or personal & spiritual growth. If you run a website, write a blog or email newsletter, or are active on social media and are interested in what we do, and think that your audience would be interested in our Essences, then why not apply to join our Affiliate Program? Equally if you are a practitioner or therapist you can refer your clients to your website where they can use your affiliate link to buy the Essences that you have recommended for them. We ship all around the world so almost no matter which country your audience reaches out to, we can ship there. You can earn affiliate commission on our complete range of Flower, Gem & Crystal Essences, including individual essences, combinations and sets, together with books and our other services. We send our affiliates a regular Affiliate Email newsletter. This keeps you up to date with our latest special offers, Essence Reviews and other marketing ideas, news and occasional affiliate only special offers.